Scharre's far-ranging investigation examines the emergence of autonomous weapons, the movement to ban them, and the legal and ethical issues surrounding their use. 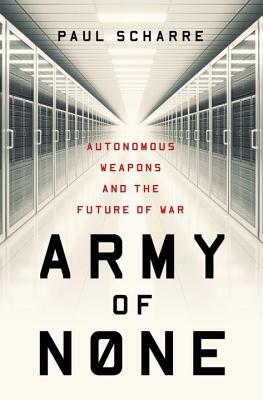 He spotlights artificial intelligence in military technology, spanning decades of innovation from German noise-seeking Wren torpedoes in World War II--antecedents of today's homing missiles--to autonomous cyber weapons, submarine-hunting robot ships, and robot tank armies. Through interviews with defense experts, ethicists, psychologists, and activists, Scharre surveys what challenges might face "centaur warfighters" on future battlefields, which will combine human and machine cognition. We've made tremendous technological progress in the past few decades, but we have also glimpsed the terrifying mishaps that can result from complex automated systems--such as when advanced F-22 fighter jets experienced a computer meltdown the first time they flew over the International Date Line.